Requires a #1378SD Small Diameter Lug Nut Key for installation/removal. Stringent quality control standards make the Gorilla Chrome Small Diameter Tuner lug nuts your best choice. These high quality Gorilla Chrome Small Diameter Tuner lug nuts are engineered and manufactured using high quality hardened steel. 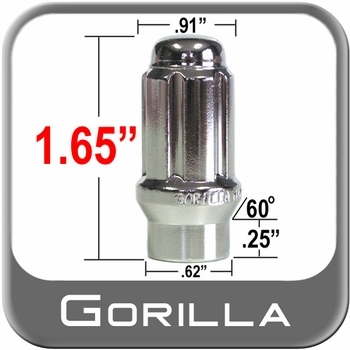 Gorilla Chrome Small Diameter Tuner lug nuts will help your wheels keep turning true. Help your wheels look sharper with Gorilla Chrome Small Diameter Tuner lug nuts.